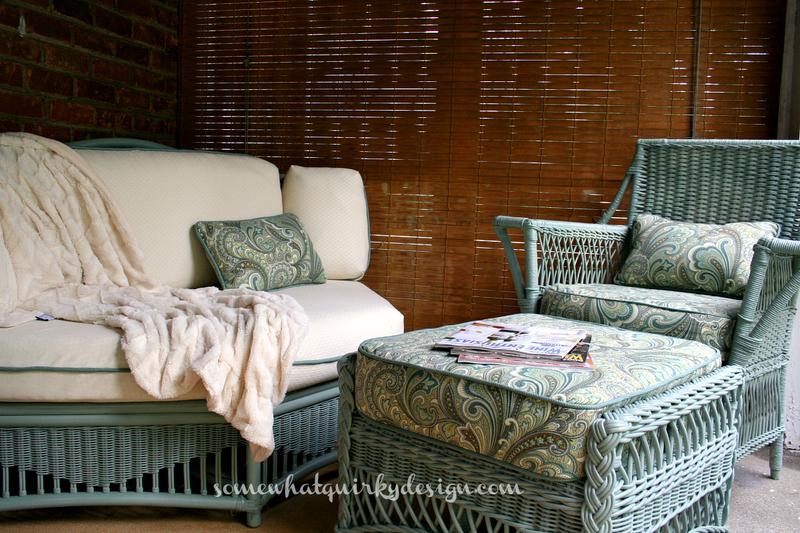 Soon after my friend Jennifer garbage picked the corner piece and decided she would use it on her screened porch, she concluded that an ottoman was necessary for optimal use of this seating. 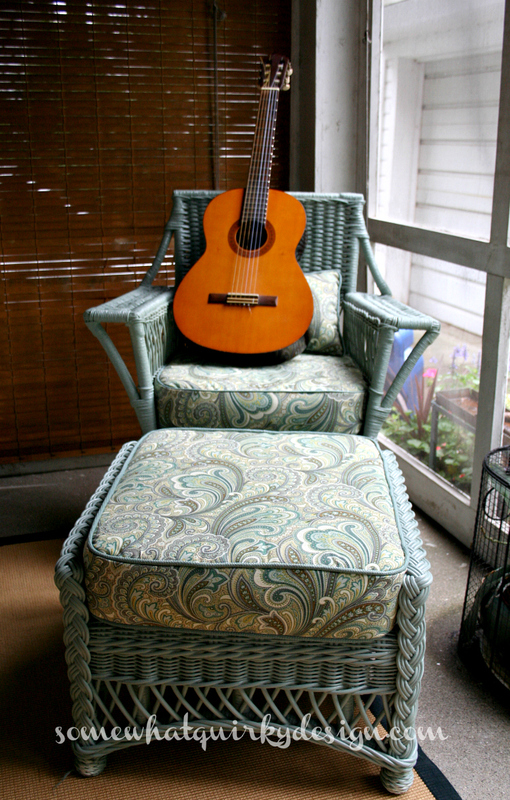 And last summer she found the perfect chair and ottoman to fit in the opposite corner of the porch. It was white and didn't quite match the creme of the covers on the rehabed luxury seating. But it was in great shape so it didn't really need anything to make it useable. This summer she painted it to match the other seating and I got busy on the covers. Yes. I'm proud to say that I actually finished these in the same summer that the cushion covers were requested. That COULD be the reason I haven't finished my own back porch . . . The welting matches the welting I used on the cushions for the corner piece. Could I just say I think it is quite lovely! But I'm going to air my dirty laundry here. Jennifer now wants to paint the chair creme. Says that the green chair eats up the beauty of the fabric. I think she is crazy wrong. I need to add here that I, and a friend of Jennifer's, had to talk her in to using this fabric for the chair. She thought it would be too busy. We said no, it would not be busy, it would be perfect. So now she wants to paint the chair and make it busy. Because it's the contrast that makes it busy. I mean she doesn't want to make it busy. She just wants to paint the chair. The "busyness" will just happen. And the whole peaceful little vignette will be gone. Your job - should you choose to accept it - is to chime in. Will it be beautiful painted creme? It doesn't really matter what I think. Or what you think. I mean, It's HER chair. In HER house. I mean, am I supposed to HIDE all the creme spray paint in the world so she can't paint it? Then just relax and enjoy yourself today! Definitely green! The look right now is so peaceful and pretty and I agree painting the chairs white will make the fabric look busy instead of blending in. I don't think she would be happy with the end result but I have seen a lot of busy chairs in homes and they love it that way. In the end, like you said, it's her chair. You did a fantastic job on the cushions. You should be proud of that and let the rest go. I don't know if my vote counts...because green (ALL SHADES) any shade, EVERY SHADE! is my favorite. So, naturally, I'm voting green. 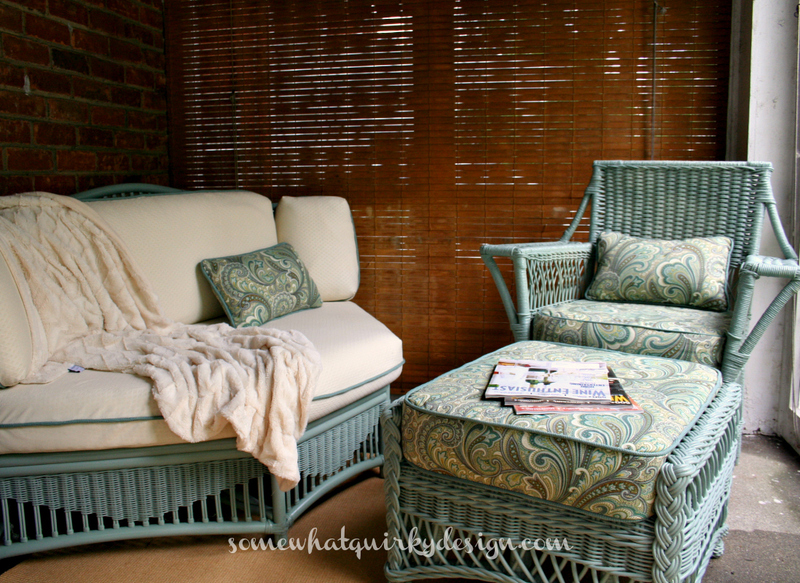 I love the serenity of this porch setting...and I'm green with envy, that I don't have a space quite like it. the cushions do look fabulous too. I agree with Gigi ^^^ it is her chair-- so at least you have your cushions... and most of all, YOUR FRIEND WHO OBVIOUSLY VALUES YOUR OPINION. A true friend indeed! Color! Green is in right now. Anyone can do creme. oh I'd keep it green. I love it! I love green, and crème is overrated. It looks beautiful! Seeing it in these pictures, the greens don't mush togother so much - but I think it needs a creme lumbar pillow. I'll hold off on the creme for a bit. The grass has to recover from the green paint! And I truly do value Karen so much. We have different tastes but she always has a thoughtful point of view and an opinion worth hearing and considering. If I did paint it creme and it looked too busy, I'd just paint it green again. Now that I have my nifty spray paint gadget so using spray paint is easy, it would be the work of a few hours. Karen doesn't mention how mad I am for this fabric and now we can't find any more. I love it so much! I have one more little wicker chair to cover and we don't have enough to do the seat. So, should I paint that one creme or green? Very cute. It's amazing what you can do with someone's toss out! For what it's worth, my vote is definitely, definitely green. I do love the green! It's super pretty. Keep it green. It's absolutely beautiful. I wouldn't change a thing and that fabric is gorgeous! It is lovely as it is; however, if you take the cushion and set it on the creme cushion for a bit, it will give you an idea whether you want creme or green. I think the contrast would enhance it !!! It's so funny... it wouldn't choose that paint color or that fabric but OH MY WORD, that is so freaking GORGEOUS!! And I would put that somewhere in my house. I adore what you did there. I would die if someone wanted to paint the wicker cream after that. I would go cream. I'm sure my vote doesn't count 'cuz everyone else said green, but I think the cream would tone it down, as well. The cream would have to match the cushion of the corner chair very well in order for the change to work. I say keep it green. It is serene, calming and quiet the way it is. It doesn't sound like she want to stir it up. Do not paint the chair! I love the color of it and the corner piece. What needs to happen is the corner piece needs cushion covers to match the chair! I just read you don't have enough fabric. 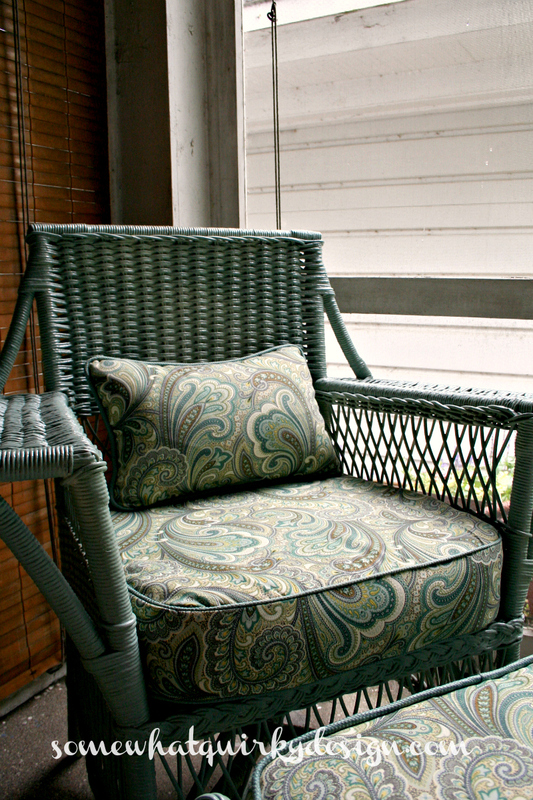 Take the fabric you do have and make toss pillows to use on the other pieces of furniture. That will tie them all together.